Location: On the N side of the junction of Woodville Road and Flora Street. Designed by G.E. Halliday in 1893 and built in 2 main phases, the aisled nave in 1895-7 and the chancel and vestry in 1901. The projected S transept tower was never completed. Perpendicular style church comprising an aisled nave with SW porch and unfinished S transept tower, and lower and narrower chancel. Of snecked rock-faced sandstone with freestone dressings and slate roof behind coped gables on moulded kneelers. The 5-bay nave has buttressed aisles with ashlar parapet on a corbel table and 2-light windows under hood moulds, except the S side which has a single-light to the E end bay and porch to the W bay. The gabled porch has angle buttresses, and ashlar parapet and gable. The gable has a canopied statue niche and a figure of a bishop holding a church. The Tudor arch has 2 orders of thin shafts. Inside is a stone bench on the L, a 2-centred doorway with continuous moulding and door with vertical ribs. The L side wall of the porch has 2 open cusped lights. The clerestorey has a corbel table to the freestone cornice, and shallow pilasters between bays. It has square-headed 3-light windows with hood moulds and diamond stops. The 2-stage S transept tower, incorporating a chapel in its lower stage, has angle buttresses and projects in front of the S aisle. On its W side is a porch under a hipped stone slab roof. Its S doorway has a Tudor arch and hood with diamond stops. Its L side wall has an open cusped light. Inside are doorways under pointed arches to the S aisle and stair turret. The stair turret in the SW angle has narrow stair lights in a splayed angle. In the lower stage of the tower are 2 cusped S windows and blind arch in the E wall. The 2nd stage has a pair of smaller cusped lights in each face. The chancel has set-back gabled buttresses, two 2-light S windows, and a 5-light E window. On the N side are 3 cusped lights and a lean-to vestry and organ loft. The N aisle and clerestorey are similar to the S side. The W front has angle buttresses with the bases of attached pinnacles on the offsets. The nave has a 7-light W window with cusped transom, hood mould and diamond stops, and broad moulded sill band. Below the window are a pair of pointed doorways with shafts to the central jamb and blind arcading in the spandrels. These are set within a single segmental arch with outer polygonal shafts continued as a hood mould. The doors have vertical ribs with iron studs. To the R of the doorway is a stone tablet dated 1895 with consecration cross. The aisles have 3-light W windows. The nave has 5-bay Perpendicular style arcades in which piers are set diagonally and have attached shafts. Thin wall shafts rise from the spandrels to roof corbels. The tie-beam roof has castellated beams and intermediate arched braces on corbelled shields above the clerestorey windows. The W window has thin shafts to the rere arch. The chancel arch is in similar style to the arcades and has foliage capitals and hood mould with head stops. The chancel has a boarded wagon roof with painted thin ribs and bosses, on a moulded cornice. The E window has a shafted rere arch. On the S side is a 2-centred arch dying into the imposts, leading to the S chapel. On the N side of the chancel is a 2-centred arch with shafts and capitals to the imposts, opening to the vestry and organ loft. The chancel also has double sedilia under cusped arches, and octagonal central colonnette. The piscina to their L has cusped arch, credence shelf, and a bowl projecting slightly from the wall. Against the E wall is an elaborate wooden reredos with painted and gilded relief panels, by J. Coates Carter and installed in 1924. A triptych has a carved figure of Christ as the Good Shepherd on a pedestal beneath a canopy, flanked by figures of Andrew and Teilo and angels. Further angels are in the hinged outer panels. The background is a pastoral scene with, on the horizon, depictions of Cardiff churches, including Llandaff Cathedral. Above the central panel is a panelled tester with brattishing. Below the central panel is an arcade of blind cusped arches with painted shields and Passion symbols. Beneath it, concealed by the altar, is a 5-bay panel with cusped ogee arches, relief foliage, and Agnus Dei to the wider central panel. The reredos is flanked by plainer wooden panelling against the E wall. In the S aisle is a Perpendicular style font with octagonal bowl decorated with quatrefoils to each face, on a thin octagonal stem and detached marble shafts with crocket capitals on the underside of the bowl. The high wooden pulpit is on a square stone plinth composed of 4 squat moulded square shafts. The pulpit has a corbelled stone base to a polygonal upper section, which is decorated with arcades of blind arches. The pews are plain, and the choir stalls have ends with poppy heads. The E window has stained glass commemorating the 1914-18 war and depicting the Crucifixion, by Kempe & Tower of 1919. In the S aisle are stained glass windows depicting St Teilo (of c1919) and the Annunciation (of c1926). The W window has stained glass in its tracery lights. Listed for its architectural interest as a prominent and accomplished Perpendicular style church, retaining good interior detail. 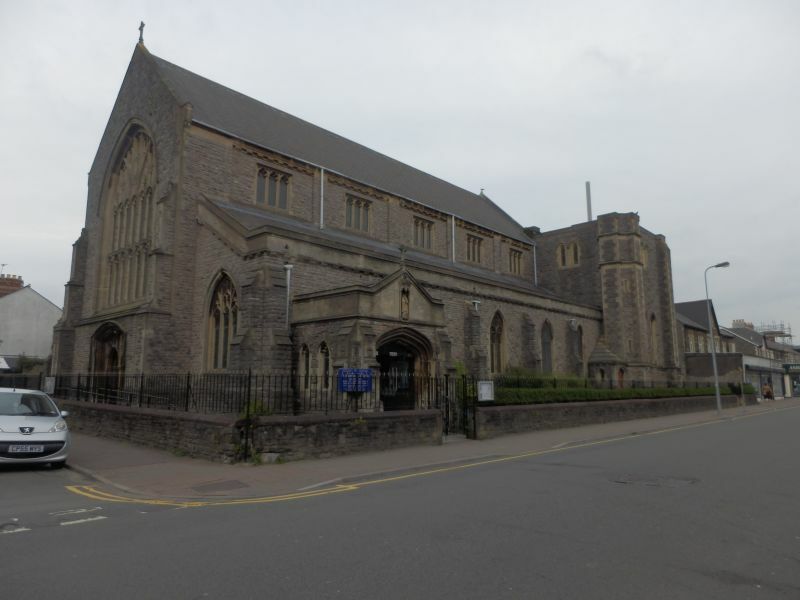 II Cathays Methodist Church including Sunday School attached to rear. Situated at the junction with Fanny Street. About 150 m from junction with Albany Road, backing onto railway line. On the SE side of the main junior school block. At the junction of Fairoak Road and Whitchurch Road, the entrance set back from the corner behind a forecourt (originally with railings). On the W side of the entrance to the Department of Music. Set back from Whitchurch Road with Infants block to SE, and on the W side of the junction of Cathays Cemetery, Pentyrch Street and Whitchurch Road. Set back from the road E of the entrance to Queen Anne Square. At N end of Cathays Park, facing S onto N side of Alexandra Gardens.